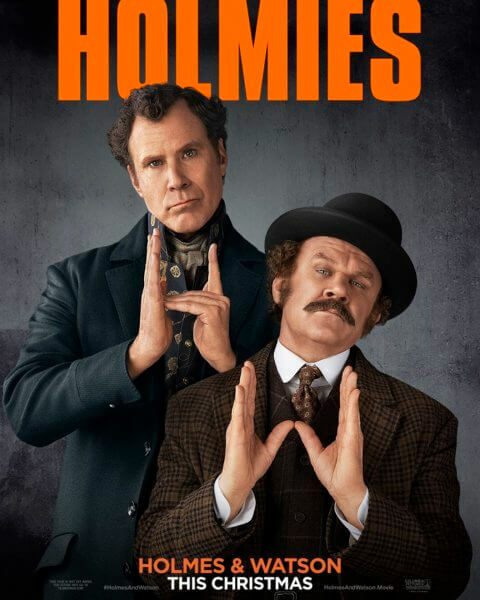 The comedic duo of Will Ferrell and John C Reilly take on the iconic characters of Sherlock Holmes and Dr. Watson in the 2018 comedy film, Holmes & Watson. Etan Cohen wrote and directed the film, reuniting with his Get Hard star Will Ferrell for this new comedy. Ferrell and Reilly previously starred in 2006’s Talladega Nights: The Ballad of Ricky Bobby and 2008’s Step Brothers. Talladega Nights raced to a $47 million domestic opening weekend. It went on to pull in $162 million worldwide before exiting theaters. Step Brothers followed in 2008, with Ferrell and Reilly playing grown men still leaving at home their parents. Step Brothers had a $30 million opening weekend and wound up grossing $128 worldwide before leaving theaters. Both films became massive hits on home video and provided some of the most memorable comedy film lines of the past 20 years. In addition to Will Ferrell and John C. Reilly, the cast of the 2018 comedy includes Rebecca Hall (Professor Marston and the Wonder Women), Rob Brydon (The Trip), Kelly Macdonald (Goodbye Christopher Robin), and Ralph Fiennes (Lord Voldemort aka He Who Must Not Be Named in the Harry Potter films). Will Ferrell, Adam McKay, Jimmy Miller, and Clayton Townsend are the producers, and Chris Henchy, Jessica Elbaum, and M. Riley served as executive producers. Columbia Pictures has set a December 21, 2018 theatrical release date.